The men’s event in the boxing discipline at the London Olympics is all set to get underway on Saturday (28 July 2012). The first day of the competition will witness bouts in the bantam weight and the middle weight divisions, where the youngest and the most experienced of the lot in the Indian boxing contingent will be seen in action. Teen Sensation Shiva Thapa (56kg) will be the first to take to the Olympic ring at the ExCel arena in London. He takes on Olympian and 2009 World Championship bronze medallist Oscar Valdez Fierro of Mexico in the round of 32 of the bantam weight division. 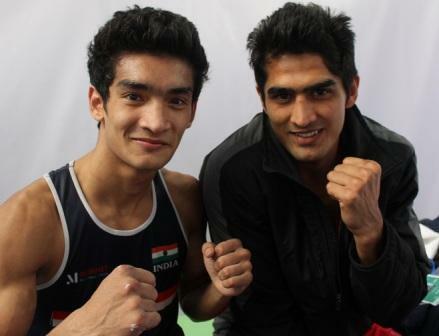 The evening session of play will witness Beijing Olympics bronze medallist Vijender Singh take on 2010 Asian Games bronze medallist Danabek Suzhanov of Kazakhstan in the preliminary round of the middle weight division. Commonwealth bronze medallist Jai Bhagwan is slated to fight Andrique Allisop of Seychelles on Sunday (29 July 2012), while Asian Olympic Qualifiers gold medallist Sumit Sangwan will battle against Brazilian boxer and 2011 Worlds bronze medallist Yamaguchi Falcao Florentino on Monday (30 July 2012). The other two Indian boxers in the fray will be seen in action on Tuesday (31 July 2012). Commonwealth Games gold medallist Manoj Kumar (64kg) will lock horns with Serdar Hudayberdiyev of Turkmenistan, while President Cup silver medallist L Devendro Singh (49kg) squares off against Bayron Molina Figueroa of Honduras. World Championship bronze medallist Vikas Krishan (69kg) is the only Indian boxer to get an opening round bye. He will take on the winner of first round bout between Myke Ribeiro de Carvalho of Brazil and Errol Spence from USA, on Friday (3 Aug 2012). Five time world champion and the only Indian women boxer MC Mary Kom will face off against Polish boxer Karolina Michalczuk in the round of 16, when the women’s event makes its Olympic debut on 5th of August’12.